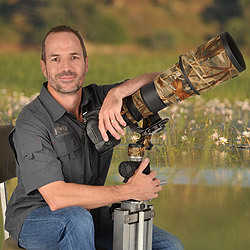 In 2005, Wenzel travelled to the USA and bought his first ‘state of the art’ Wildlife Photography camera – a Sony F828! Over 5000 images later Wentzel came to realise that to become success in Wildlife Photography requires a DSLR and appropriate lenses. After a lot of research Wenzel decided to buy the then latest Nikon D90 with the 80-400mm version 1 lens. Every opportunity now to get to a small dam, water hole or National Park was used to hone his skill but constantly travelling between Europe and South Africa meant that opportunities were far and few in between. At least countless weeks in a London hotel room provided ample time to read all there was regarding Wildlife Photography. On one of his “home weeks” in South Africa, Wenzel decided to make use of the free training Nikon then provided on the actual camera. He met Hendri, then director of Nikon Professional Services and within 3 month Wenzel attended the inaugural Kgalagadi Safari hosted by Lou, Veronica and Hendri Coetzer. This Safari convinced Wenzel that there is a major advantage in travelling with professionals to avoid making the same mistakes over and over again. Armed with this knowledge, Wenzel over the next 12 months attended several workshops and Safaris by various professional Operators in search of the best. His journey brought him back to CNP Safaris, where the client is certainly first on the agenda! Fast forward 8 years later, Wenzel and The Coetzer’s struck a personal and commercial friendship in the middle of this and Lou personally took Wenzel under his wing, developed his skill to a professional level. Although Wenzel is not interested in entering Wildlife Photographical competitions, he is a member of the Photographic Society of South Africa, and obtained his Associateship in Wildlife Photography on first attempt. Since 2013, Wentzel has successfully led numerous CNP Safaris across the African Continent. Wenzel’s sense of humour, incredible work ethic and focus on client’s needs has made him a favourite among many CNP Safaris Clients.